Hydrothermal vents continuously belch out hot, mineral-enriched water, and are known to support communities of organisms on the ocean floor. Now, researchers in Japan suggest that the chemicals they release can set up redox reactions that cause electrical current to flow naturally around the vents.1 Nearby microbes may directly utilize these free electrons, the researchers say, and they could even have helped synthesise compounds necessary for life to evolve. In 2010, Masahiro Yamamoto and colleagues at the Japan Agency for Marine-Earth Science and Technology (JAMSTEC) and the University of Tokyo showed that, in the laboratory, mineral samples from a hydrothermal vent chimney conducted electricity.2 An electrode made from the chimney’s inside wall could catalyse the oxidation of sulfide ions to elemental sulfur in synthetic hydrothermal fluid. A second electrode made from the chimney’s outer wall could drive the reduction of molecular oxygen in synthetic seawater, suggesting a current could spontaneously flow across vent chimneys. Now, the JAMSTEC team have used a platinum probe to measure the redox potential around two hydrothermal vents in situ. The first is topped by a 6m-wide flange, and the team found that even in places where there was no hydrothermal fluid, the potential of the seawater above the flange was about 100mV lower than normal seawater. 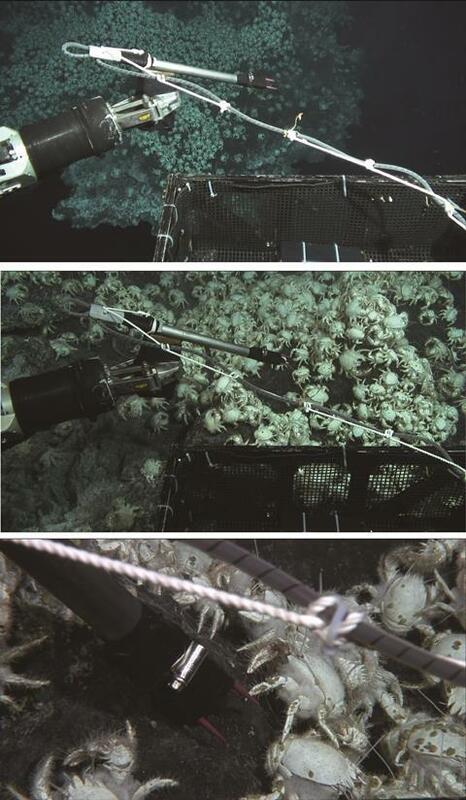 At the second site, a 6m tall hydrothermal chimney, the researchers measured significantly depressed redox potentials all the way up the outer chimney wall and at multiple points up to 75m away on the seafloor. They conclude, therefore, that spontaneously generated electric currents flow widely in the conductive mineral deposits. Bacteria that grow in the laboratory on electrodes, using the reductive power of electrons to obtain energy, are well documented; but it has been unclear whether this so-called electrotrophic pathway occurs in nature. However, bacteria that use electrons from reduced inorganic compounds as an energy source are ubiquitous around hydrothermal vents. Yamamoto’s team suggest that some of these bacteria may instead use electrons from natural currents. They also speculate that ’electricity from hydrothermal vents could have been the reducing power needed to synthesize the organic building blocks for the primitive pathways before the origin of life’.